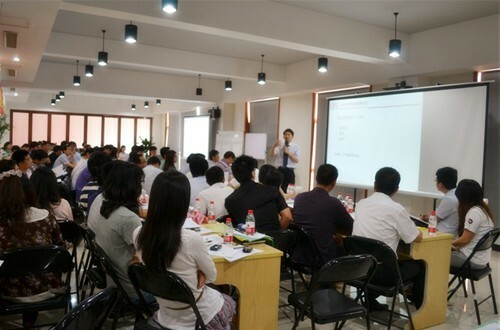 May 21 to 22, 2011, Zhongshan University Professor Cao come to the Shanghai Shibang company, and opening a 2-days exploration-enhance journey on "mid-level integrated management skills " together with Shibang company superintendent and above. Several years as a management consultant business management and consulting experience, Professor Cao first analysed the nature of Shanghai shibang company as a manufacturing firm. "As an enterprise, should put maximize create value for customers at first place. If reflected in the manufacturing sector, it is reflected in three indicators: efficiency, quality and cost. " Next, Professor Cao described and analysed ten aspects in the management awareness, role perception, work plans, enterprise management mechanism, execution control, etc. Through a comprehensive knowledge of management analysis and simulation of the actual field cases, many effective methods of management have been recognized by the participants. Finally, Professor Cao shared with participants the "twelve field " which can enhanced team creativity and cohesion. Only through different latitudes' effective management and incentive, employees and enterprises can create win-win situation.